Take a look at this cartoon. These are the kinds of jokes we make around Boeing. 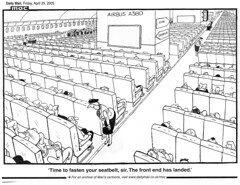 Its really cool to see other people (yes, cartoonists are people) recognize the flaw in this airplane. Its really not that technologically advanced... its just freakin huge. The 787 on the other hand has technology so advanced that we had to steal it from aliens. Hahah sweet.. I guess we'll find out which jet is the one airlines prefer. Ours may have more technology in it but one should remember that airlines by definition lose money. Therefore they might be more inclined to take flying farms like the A380. Ours do last longer so hopefully that's also worth something to them. Haha... I'm sure Boeing wishes it were that easy.